This week, the designers were joined on the runway by guest judge, Jessie Tyler Ferguson. He not only was the guest judge, but also brought forth this week’s challenge. Ferguson has created an organization, Tie the Knot, which helps to raise funds in order to assist with the fight for marriage equality. Part of the organization is making fashionable bow-ties, which the designers had to use this week for both inspiration and incorporation with their finished garment. 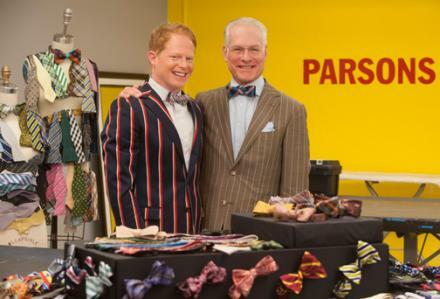 I’m sure many were thankful upon seeing the bow-tie that it was not a menswear challenge! The suggested budget was $200 and this was a 1 day challenge. It would have been great if this episode could have focused a bit more on this cause and the challenge, but sadly, 1 designer made himself the central focus. Most of what is likely to be remembered from this episode was the dramatic runway firsts created by Sandro. I will get back to that more in a bit, but first, the designers had received their challenge and were off to the workroom! The designers were all a bit stressed it seemed this week. There was a lot of second-guessing and finishing of work right down to the wire. I’m sure many were trying to live up to a challenge and a cause they believed in. Others I think were just not sure what to do with all of this creative freedom. We saw during Tim Gunn‘s midway critiques this week that some designers, such as Helen or Sandro, were not doing too well post-critique or from critiques. We also saw behind Sue’s process in that she was unsure from the get go. She used doubled the budget and as we later saw that was all for nothing as she ended up in the bottom. So what was all to come from this craziness in the workroom? Who stood out on the runway with their bow-tied garments? I was pretty much on the same page as the judges this week for the Top 3 and winner for this week. I wasn’t surprised that Dom was included since the judges really seem to be taking to her design aesthetic. I am not there yet, but her striped mini with structured bow-tie neckline was perfectly fine. It had a great fit and looked polished. I was not a fan of the neckline area myself as it just looked a bit messy. I actually had Alexandria in my top 3 as her look also looked great, fitted and didn’t use the bow-tie incorporation so literally. I could see someone actually wearing Alexandrias’ without curiosity as to why a bow-tie was there. The other two top 3 members were certainly deserving. Kate’s look was so unexpected from her and the pants she made looked so hot! Bradon also did a great job and I was happy to see he won again. He is such a standout this season and I hope he stays on top every week and is at the finale! His look with the bow-tied crop top was so intricate and perfectly matched with both a pair of shorts and a jacket. That is a lot of work he did this week and in such a short time-WOW! Moving on now to the bottom 3. I had a completely different bottom 3 this week, which included Sandro. So he could have left for me in the traditional way of being in the bottom, but sadly and dramatically chose a different method. That is all explained at the end of my post, but back to the non-dramatic designers this week! Many looks were kind of boring, a bit sloppy, or just didn’t look great. I would advise for those I had in my bottom 3, Helen, Alexander and Sandro, and really a couple of others that they should be on the lookout for weeks to come! I guess it was pointless having Helen in the bottom since she was safe with her immunity from last week, but I’m glad the judges said something. She shouldn’t have felt safe this week. So I guess if I had to take her out, Sue would have been my next go to and she was in the judges’ bottom 3. Her look was clearly over-budgeted and for no good reason. The use of bow-ties was so abstract and kind of made for a hard to manage garment. I felt bad for Jeremy being in the bottom considering his bad news, but the whole ensemble was a bit drab and just not very fashion forward. He has done other great pieces so I’m sure this was just a fluke. Rounding out the judges’ bottom 3 was Miranda, who I am not a fan of, but I’m guessing she took the spot of Helen for the judges. My problem with her repeat pencil skirt, was just that. I am not seeing a lot of diversity or creativity from her. A pencil skirt and a crop top we have seen now 3 times. But, luckily for the bottom designers, they were all safe thanks to…….Sandro and his crazy runway antics, which all made for a couple of firsts on Project Runway. Sandro’s demise was clearly going to a hit a boiling point from the start of the season. He often came across as rude and loud. This week in particular, it was evident he could not handle critiques or anyone’s opinion but his own. It also became evident that he has some huge issue with Zac Posen. I am not so sure as to why since all of the judges have offered critiques. So the first runway first from Sandro was speaking to the judges upon him finding out he was safe. Generally, when a designer finds out they are safe, they all march to an offstage room, and yes, they can then complain. However, Sandro decided to ask the judges for some notes right on the runway. It happened right after the judges jumped on Helen for her garment and only being safe because of her immunity she won last week. Zac offered both harsh and constructive advice. It was clear Sandro did not agree and Heidi eventually shooed him off by saying maybe next week we can offer more if you are in the top or bottom. In finally getting to the offstage room the designers of course began to discuss what just happened on stage. Helen was upset because of what was said to her and so of course, Sandro chimed in. However, several designers pointed out that he should have not done or said what he did. There is a time and place and his statements to the judges were unnecessary. Helen and others called it what it was, DISRESPECT. This is all when things started to unravel. Ken had jumped in and the two were just going back and forth, with of course the voices getting louder and louder. It was then we saw another Project Runway first from Sandro and he busted out of the room and out of the building. He was knocking things down, throwing off his microphone equipment and knocking out a camera. Due to all of this, Sandro was the one who was gone this week and all of the other designers were safe from eviction. So for me, Sandro’s design this week was poor enough to send him home, but if he wanted to go out showing childish behavior then so be it. Future lesson for casting when you try to cast for the drama, there might be signs of someone being too dramatic! Next week we are back to team challenges and yet again with another unconventional challenge, which makes me wonder how dramatic are they trying to be this season! Anyways, can’t wait!